(because it was too hot to do anything!) I cast on for the color work mittens yesterday. Latvian braids naturally twist the yarns up, and with 6 yarns--(3 per mitten!) it was a mess. But doesn't it make a beautiful edge? The cast on edge rolls forward (the single row of knits does that) the beraid, (purl and floats on right side) bubbles out, and looks more substantial. 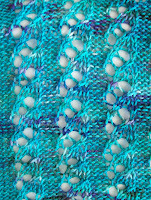 Combinded, the alternating rows of knit and purl make a non roll edge—or perhaps more accurately, the alternating rows/rounds of knts and rows/rounds of purls balance each other to control the roll at the edge. But now the braids are done (well, there will be another set at the end of the cuff). I've started the black and white cuff—a small, simple pattern—white stars on a black background. I went looking for a design—and found one in a photo—so I am using the photo as my chart. The beginning is simple, it get more complex in the next round, and then simple again. 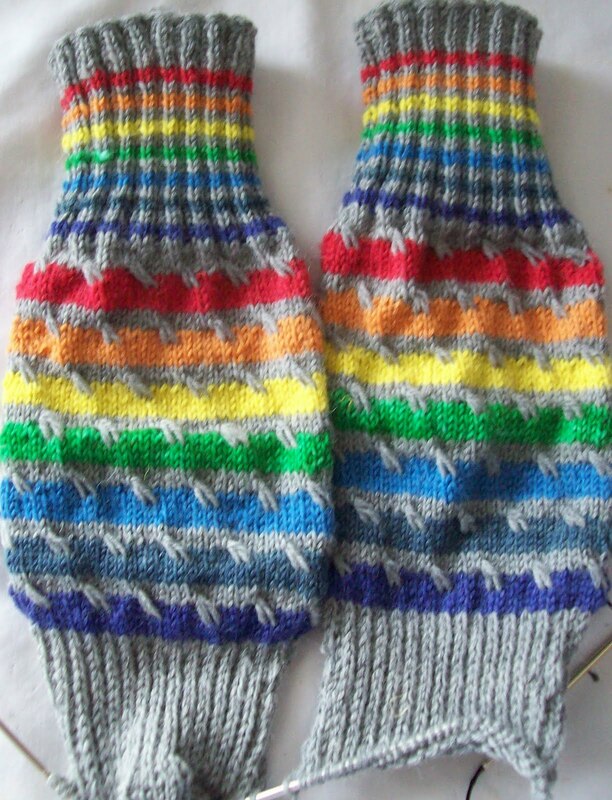 Men who have experienced the pleasure of hand knit socks, or hand knit hats, or hand knit mittens tend to chose HAND KNIT first and are less concerned about the colors. (I know some knitters who' husbands will wear lacy socks in knit in a color array yarn that includes a small amount of PINK). 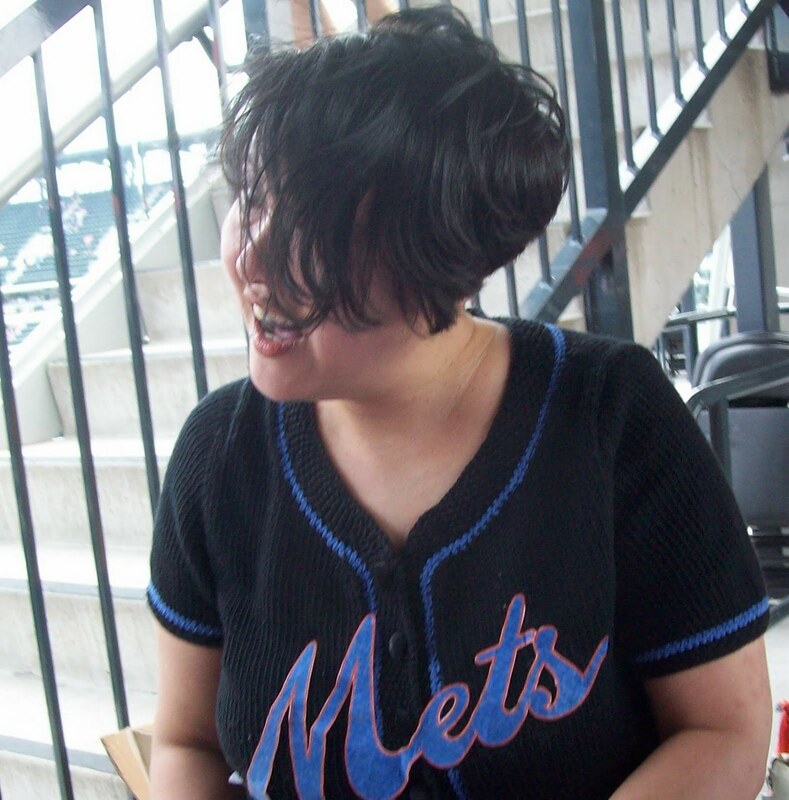 The tank top is edging its self into the first place—we'll see—maybe by tomorrow I will have made up my mind. I am not the greenest person—but I make efforts. One green choice is energy start appliances, (computer too! ), another is no A/C. Most of the time, it's fine. I live high up (14th floor), my apartment has 3 exposures ( east, south, and west--(none are exact—but close enough). I am ten miles or so (as the crow fliess) from the Atlantic (south, because LI more or less juts out) and it's not uncommon for me to be able to smell the salt in the air from ocean breezes. And then there are days like the past week-- HOT Hazy and humid.. (not much fun) and the air so still, its feels solid—and its not much fun to breath. But worse,the evening are the same. Yesterday's high was in the mid 90°'s (bad, but I spend a good part in doors with AC (not at home!)) --but last night the low was in the 80°'s, (OK so it was 82°) but 82° with high humidity is no fun. 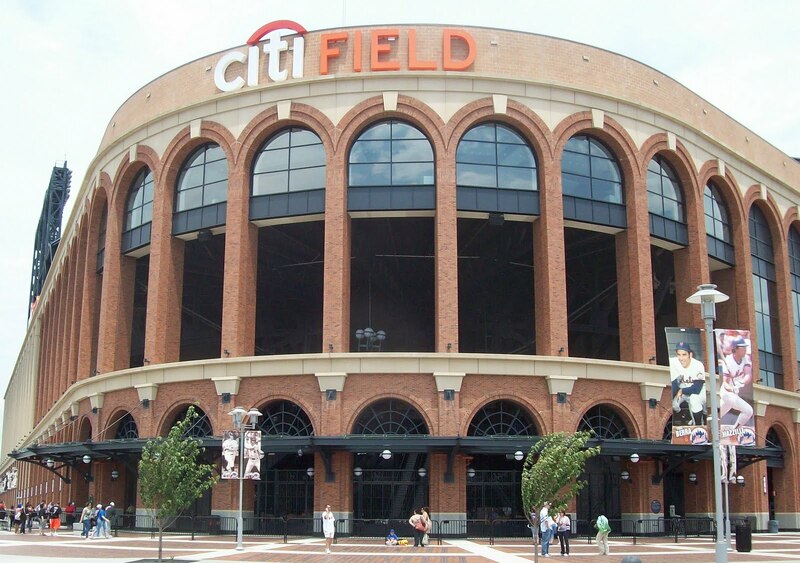 And the air was still—and no amount of fans could really make it feel comfortable. No pictures of my skirts (2 new ones now, plus 1 more mended) No pictures of my computer desk (better but still unfinished) but LOOK Yoga Socks—not done either, but just a row or two more, and I'll bind off. And while I do have a collection of yarns crying out to be made into socks—I am taking a turn for the moment-- and will be casting on some mittens—Pair 1? Green, black and white. I'll finish the yoga socks AFTER my swim. Normally, I avoid the pool in the early morning and after noon—there is NO shade at these hours, and the sun is at it most intense, but today, I want to get in and cool down—I'll be home by 1 PM--(and hide out till after 3) waiting for the sun to move behind the building, and go back late in the afternoon (4 to 6) –if there aren't thunderstorms. That's the prediction—a HIGH is moving east—There will be strong winds, and chances of storms, and behind the storms, cooler weather! Tomorrow will be 87° or so (hot enough!) but this evening, and tomorrow evening will be back down to the low 70°--with drier air. 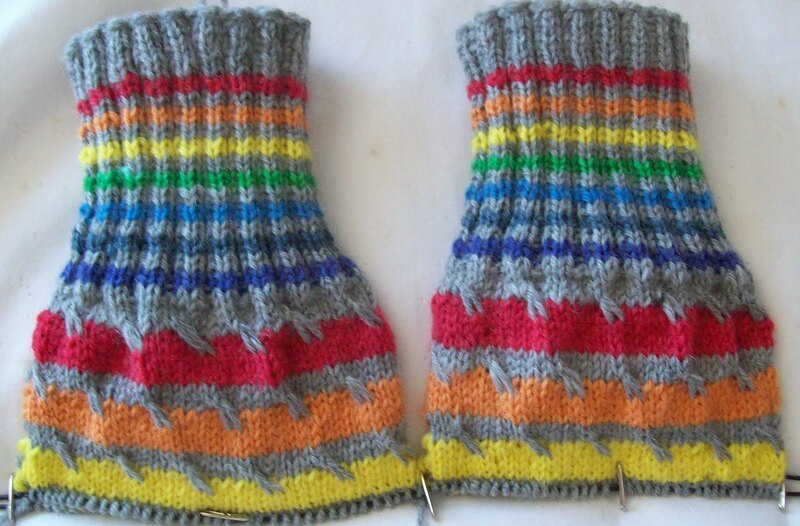 Maybe by then, I'll have also cast on for the mittens.. 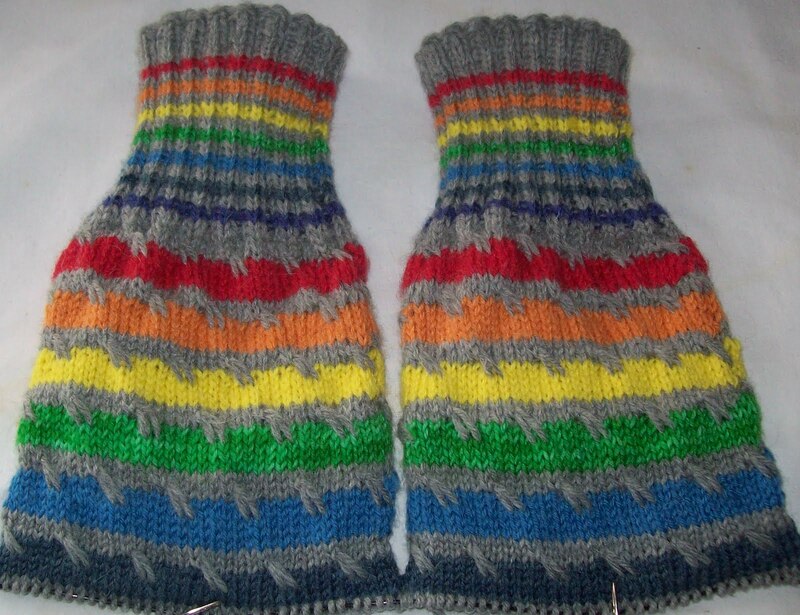 I haven't a pattern yet—just some ideas—a braided cast on, and braided trim--(3 colors—black, white and green) a cuff of black and white, and then green fir trees on –I haven't decided—should it be on a snowy white? Or a long winters night of black? 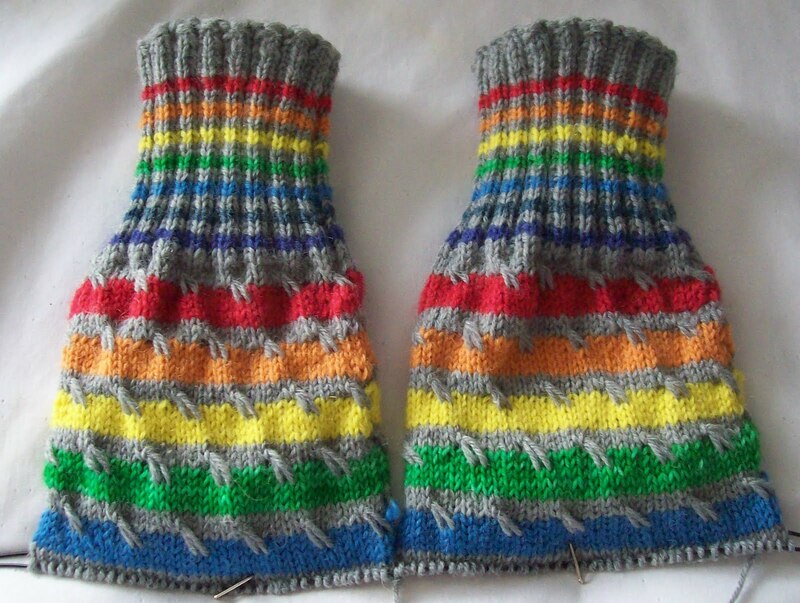 Well goodness knows, I enough socks right now to last for a few years!--I don't know what will be happening with the mittens--I NEVER WEAR mittens! But I think they will be fun to knit. 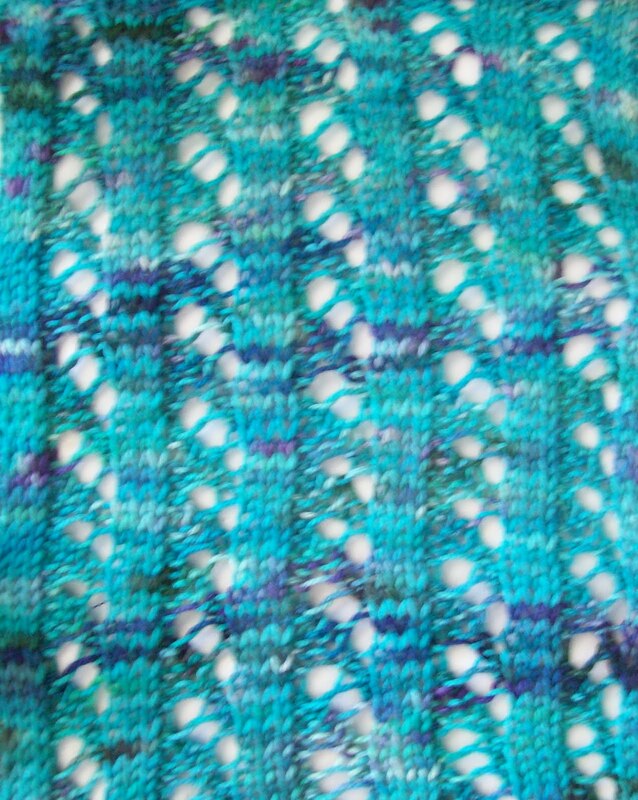 Here it is Knit, not finished, not blocked—and it looks OK. When i finished (with about 2 yards of yarn left over!) 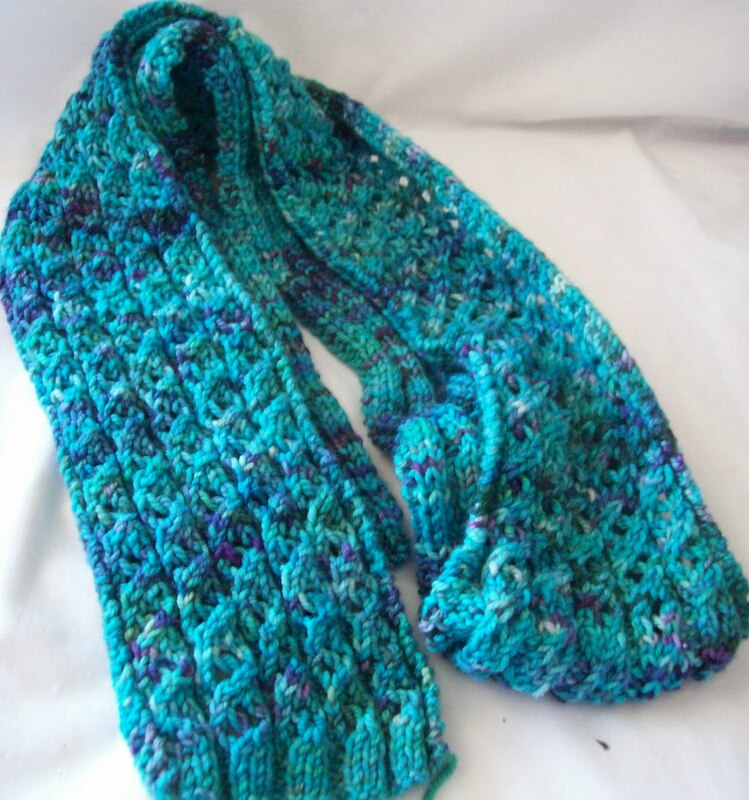 , it was, unstretched at all, about 4 inches by 62.
but the pattern is almost a rib--(alternate columns of knit lace, with columns of purls between)--slight stretched (and on the needle) it was about 6 inches wide. It's warm and humid today, and I think, even with the fan on, I will have to wait till tomorrow to show you the scarf draped and lovely looking—but it is a nice start. I especially like how the dark purple makes zig-zag waves thought the piece. 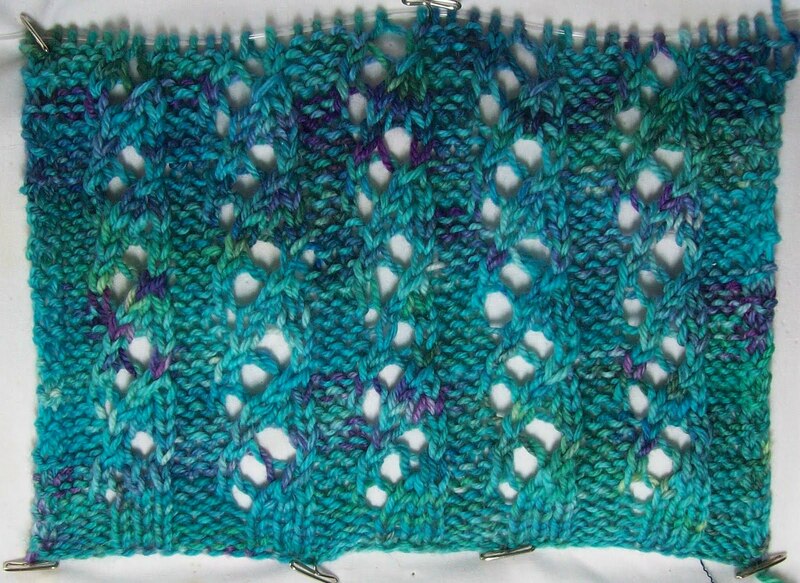 Its always chancy how hand painted yarn colors are going to pool--and the zig zag waves are not consistent--but recur often enough--with no major pools or splotches, to make a nice pattern. The Yoga sock have been cast on (the Russian Knotted cast on,) but with a scant half dozen rounds knit—they don't look like much-so I didn't bother taking a photo. I rarely use a whole skein for a pair of sock—and never use a whole skein then I add contrasting cuffs, heels, and toes. These stock won't have heels or toes—and with deep contrasting cuff, I should have plenty for a short leg, and short instep section. 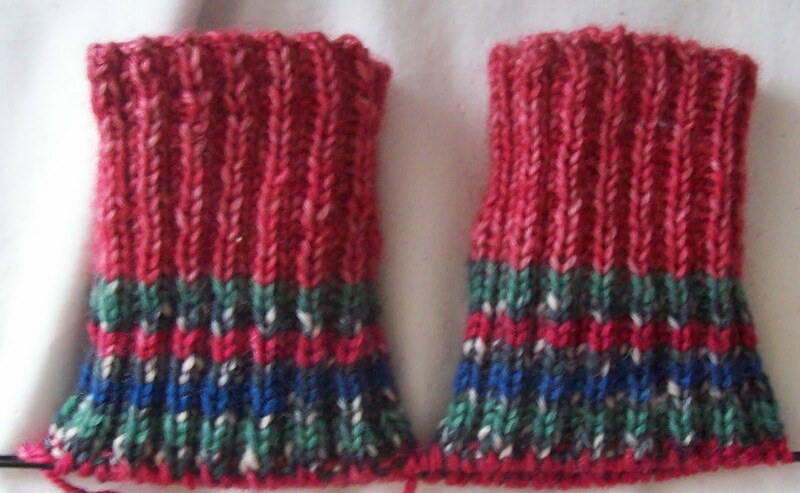 I don't expect to have more than inches left over of the self striping, but I should have enough of the rosy red to use to trim out another pair of socks. 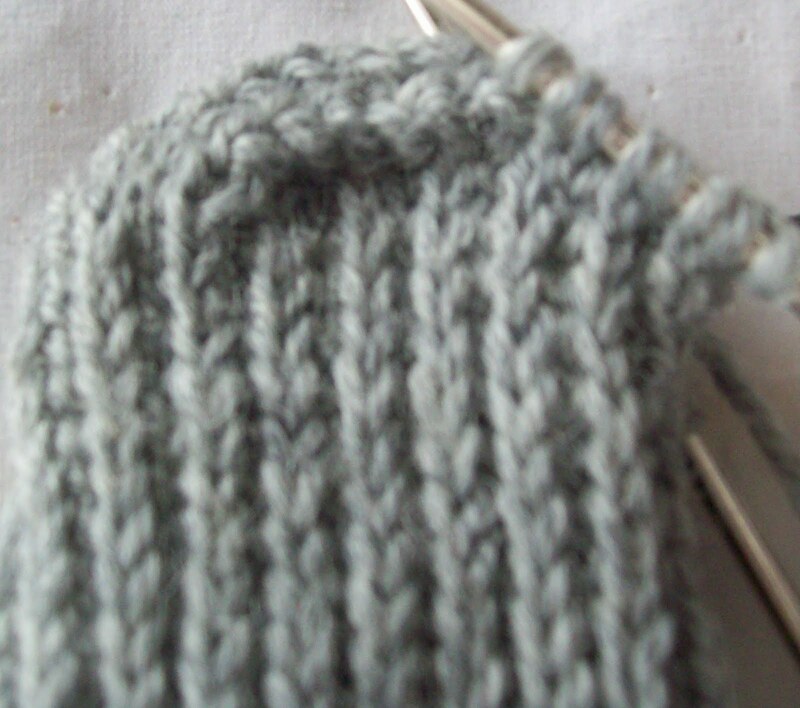 C—Its a single yarn cast on, and I can use it again—and have some constitantcy after the heel opening. What next? 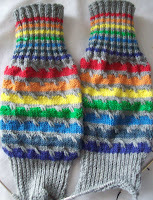 Maybe for the NOT socks project, a small vest out of the Noro I have--i think something like EZ rib warmer-- but not. 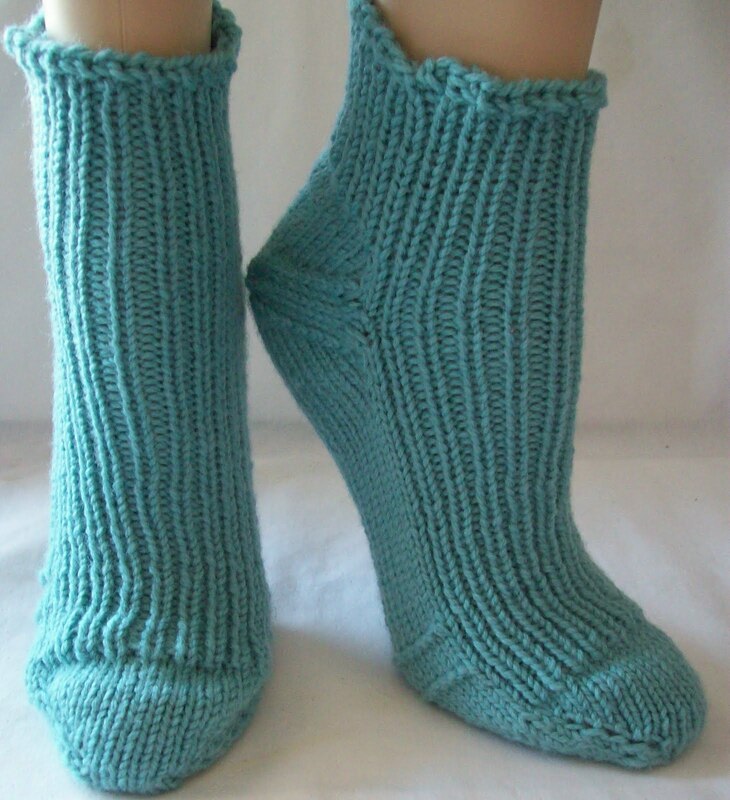 Of course its fast!—only 36 stitches per row—and it's size 5 needles. 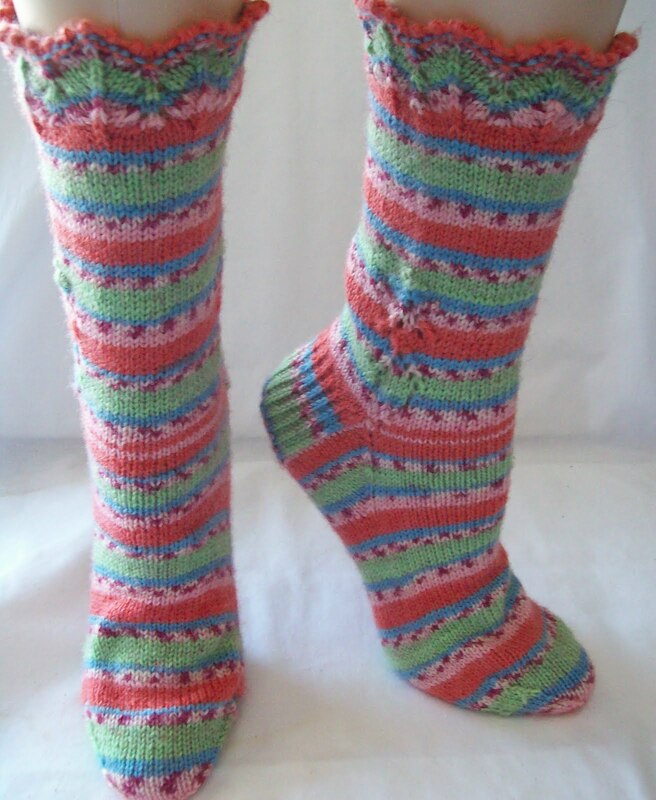 Compared to the socks I have been knitting as of late, it's nothing to do a row! I am not half way done with the skein (by weight) and it's already over 25 inches long.. So it will be at more than 50 inches long—likely closer to 60 inches. Like it? 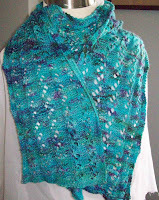 It will almost certainly be a pattern for sale once I've finished it and blocked it. Even just pinned out, it looks lovely. 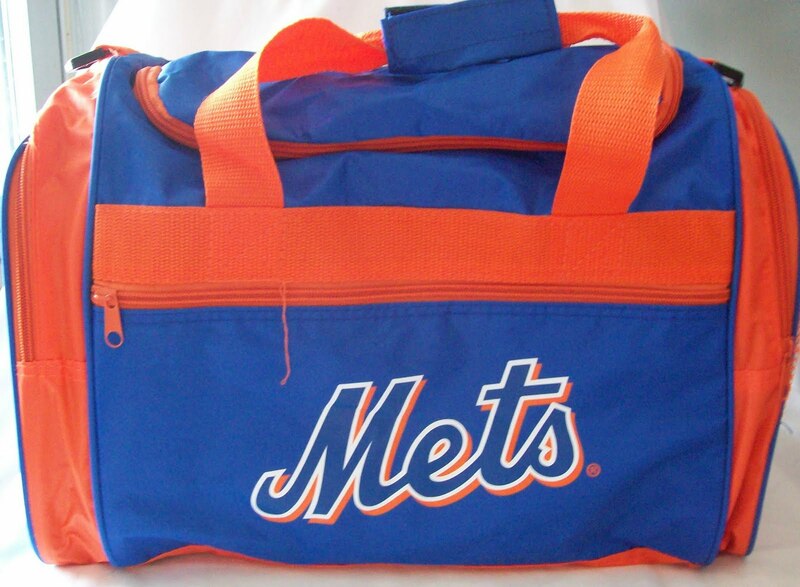 And while its not reversible, the back looks nice too. There has been some pooling, there is not a lot, and no unattractive puddles of color. By now, I know the stitch pattern--perfectly--and it's just complex enough to be interesting (as I start repeat 30 or so) but not so hard that I can't do it late at night, or while watching TV. Tonight I'll start with the Yoga half socks... They will be quick to knit too, even when worked on small needles. 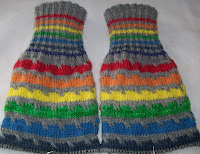 I have a list-no make that LISTS –of sock ideas, of Vest Ideas (I knit 2 sweaters last year, and even in the rush of having new things to wear, I don't think I wore either more than 3 times). 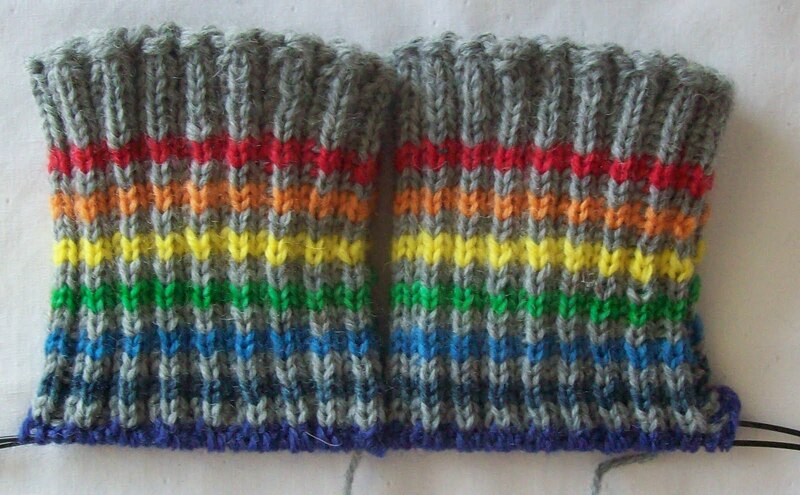 I have some hats I need to knit, and maybe some more fingerless gloves, and even a pair of mittens. 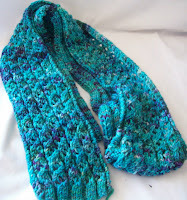 Then there are the scarves and shawls I WANT TO KNIT (I do?) in silk! And clothes to sew, and clothes to mend, and my work is cut out for me! A bunch of chore need doing too—and throwing out—I done a lot of that already—but I am such a pack rat—I have to work hard and getting rid of thing--I need to work as hard at getting rid of things as I do at turning stash into things! But almost on both accounts! 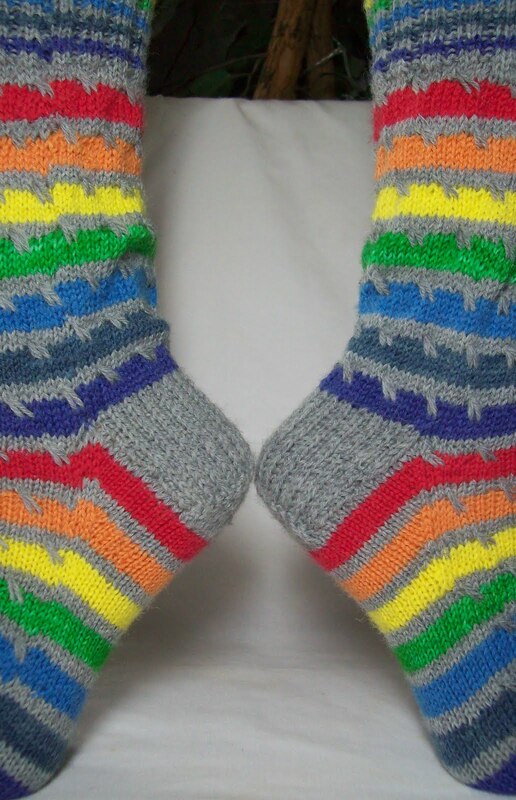 There are still 3 ends to weave in, and the toe to shape and finish.. but ROY G BIV the third is finished. And they look good!--but you'll have to wait till tomorrow to see the finished results. 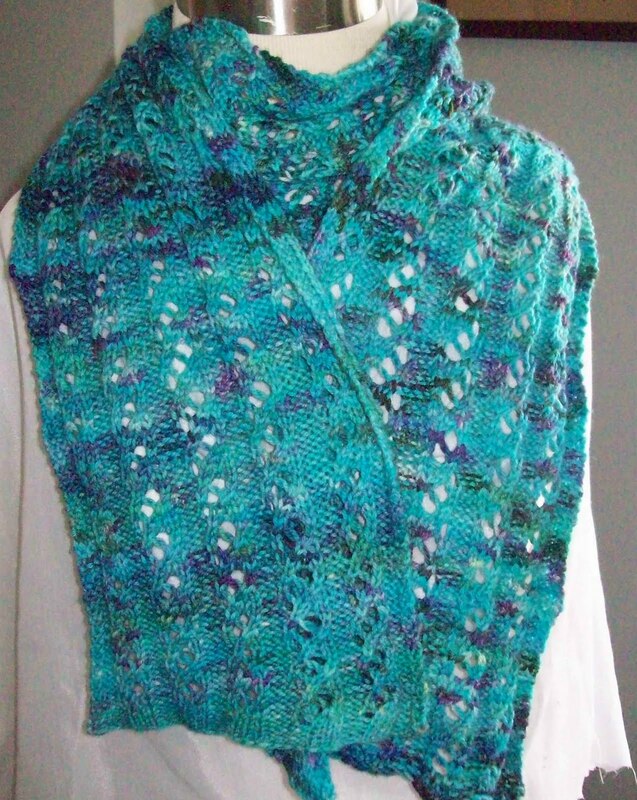 I love color work in knitting-- always have—I learned it long long ago, when I was too you and stupid to know that is was thought to be hard—and lacking that knowledge—I didn't find it hard! There are so many options to incorporated color—you only have to look back at the past few months, to know—I love self striping and self patterning yarns—this is color work at the easiest. I frequently add a solid yarn to commercial color ways—to make them more of my own—but really—self striping and self patterning yarns are a great way to get started with color work. These socks a perfect testament to color work that I often advocate for beginners—stripes (look at the pattern—simple stripes—on the sole). Stripes are often overlooked—but custom stripes are worth all the effort of weaving in the ends. Getting the colors and proportions YOU want is always is worth the effort. Random stripes, and spiral stripes are other options (been there, done those too! 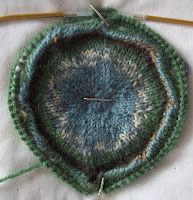 )are other often overlooked options for beginning color work. 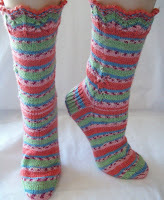 Now, look the pattern—the simplest pattern—stripes and slip stitches. 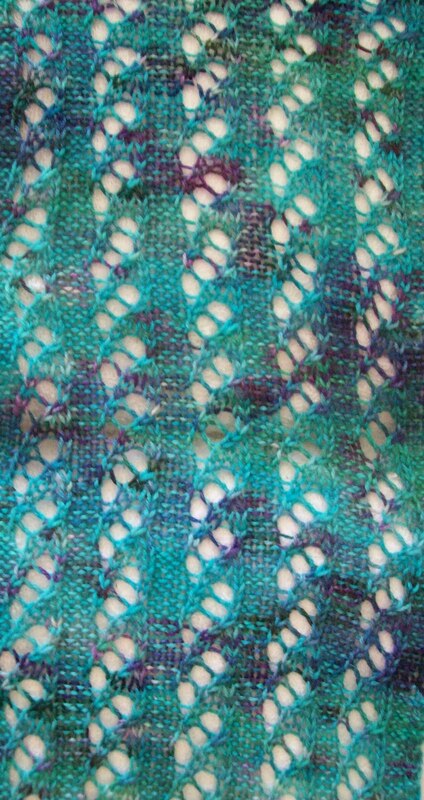 The stitch pattern is based on 'scattered oats' Kx, then do a double wrapped stitch. 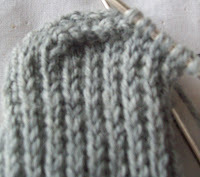 Slip the double wrap for a few rows (rounds) and then, drop it, knit 2 (or 3) and knit the dropped stitch. The double wrap create the ease needed for the elongated stitch, and the drop, knit some and then knit the drop stitch created the movement. 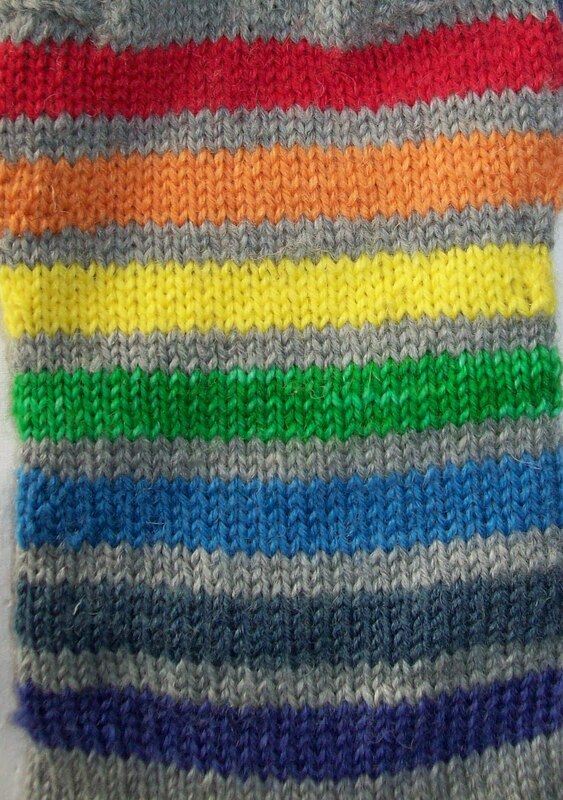 I was looking for something like the effect of rain drops--(and rainbow stripes) and I also want to break up the straight line of the simples stripes—but this scattered oats stitch also look lovely worked in a single color. 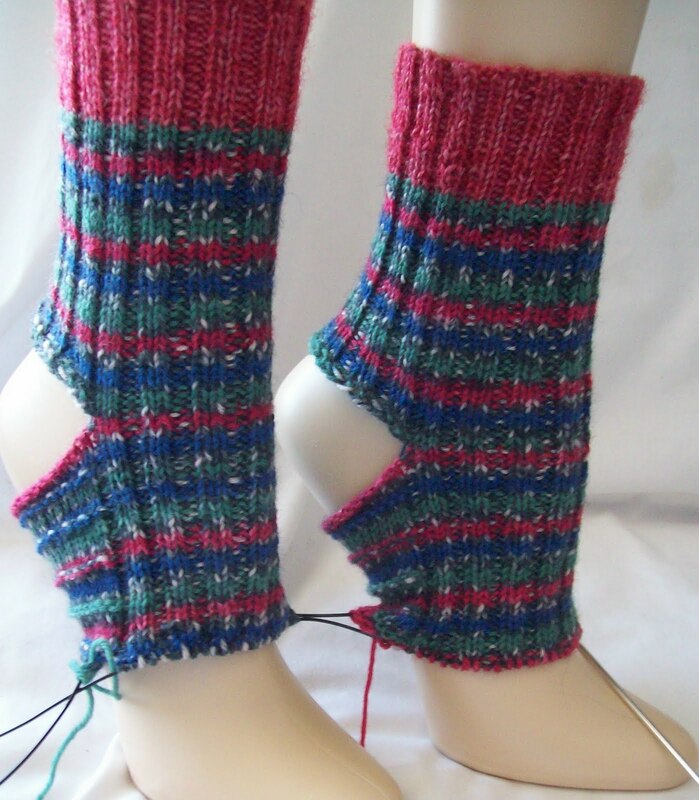 I've done elaborated color work in socks—and I've done the simplest of sock with nothing but a self striping or patterning yarn. 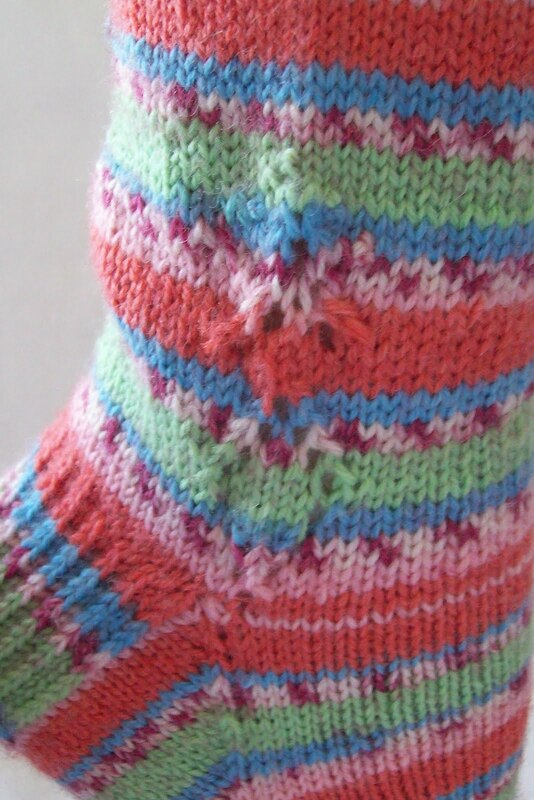 These socks rather simple as a process—stripes and slip stitches are easy beginner techniques. And the color choices—the spectrum—are hardly difficult ones to work out. But there is a gestalt—the total is greater than the sum of all the parts. Some commenter's have called them happy socks—and they are—Rain drop and grey—and a rainbow.. what could be happier? The new pattern is emerging—And I like it! 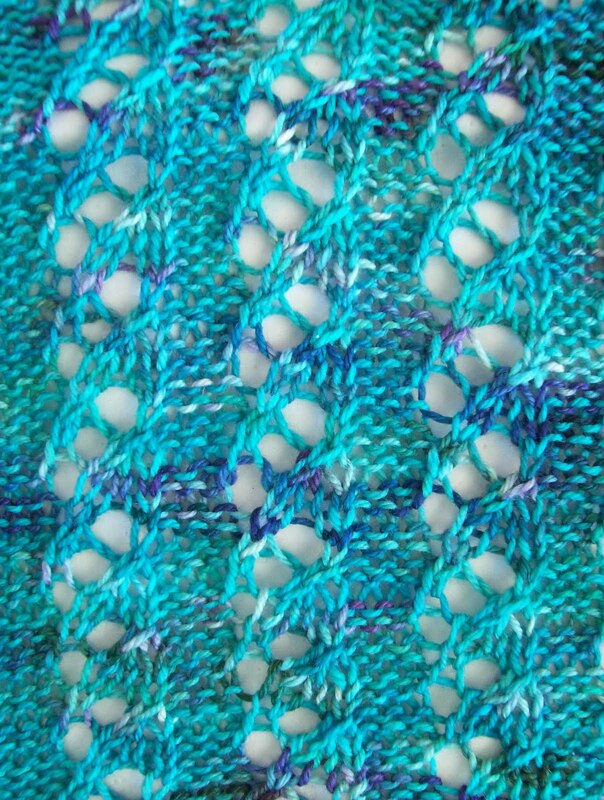 I love self patterning yarns—be they jacquards, or stripes, or just mutli color hand painted look. But nice as any of them are, they are OTHERS choices, others designs. A sort of color by number sock pattern. I wore my Crowning Achievement socks last week, and Lots, and LOTS of people said “ I love the colors” I said thank you—but really, I HAD NOTHING TO DO WITH THE COLOR SELECTIONS—well nothing beyond basically agreeing with all my complimenters—and chosing and buy the skeins of yarn. Once in a while, I will make a totally generic sock with a self patterning yarn, but more often, I try to add something—a stitch pattern, a bit of contrasting yarn, an edge, a novelty heel design—something that changes the sock from just using someone else's design—exclusively—into a design that has something of me in it. I suppose its a bit of vanity—but I am creative, and I want my socks to be reflective of me. 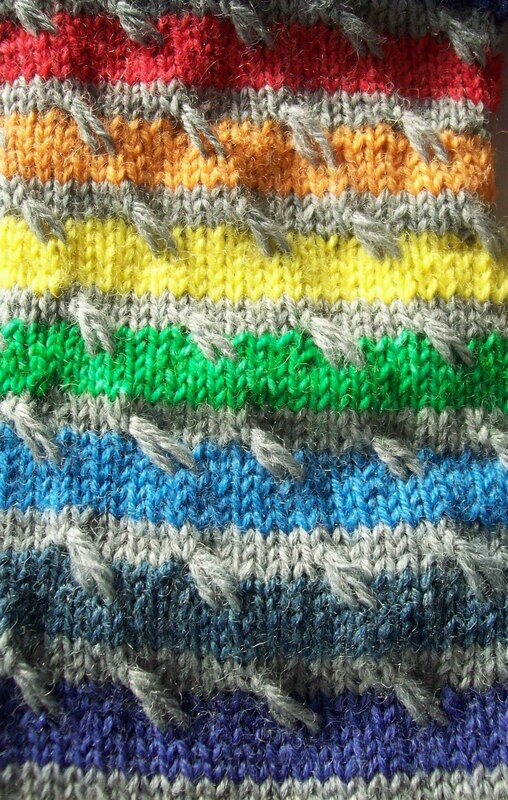 Sure it's work to weave in ends every 5 R's—but it's so worth it to have a simple stripe that is MY STRIPE. My design. 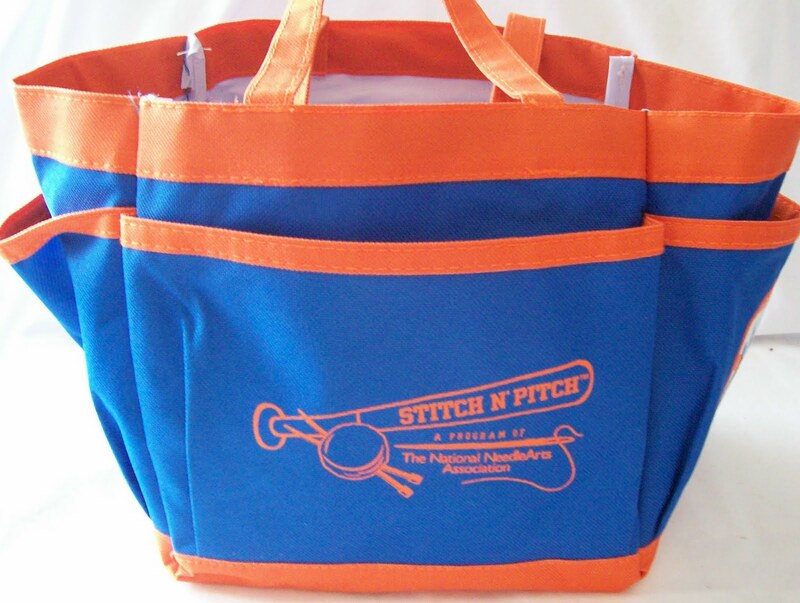 ROY G BIV is hardly a new creative color way.. and the stitch pattern, a version of scattered oats is nothing very much either.. but together, the two become special. 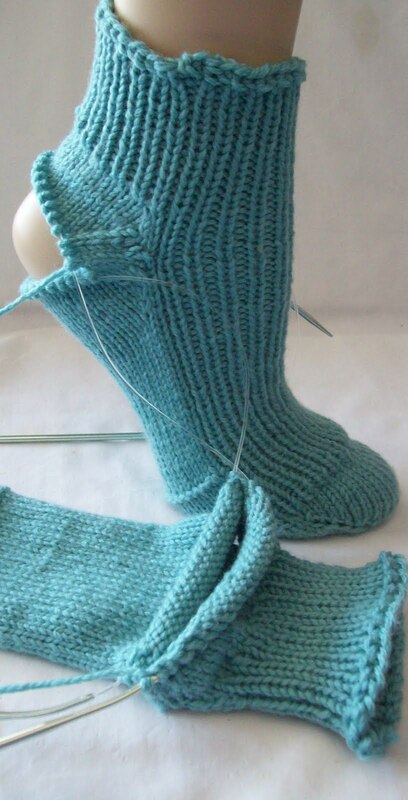 I like working out the details (and will be pleased no end when it comes to the heel and gussets to be able to have a perfect unbroken pattern on the instep) I like seeing how what I imagine become reality. 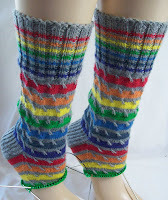 And, of course, with a ROY G BIV color way, these socks will match everything! Finished (natch) yesterday. And eventualy, I started the ROY G BIV. 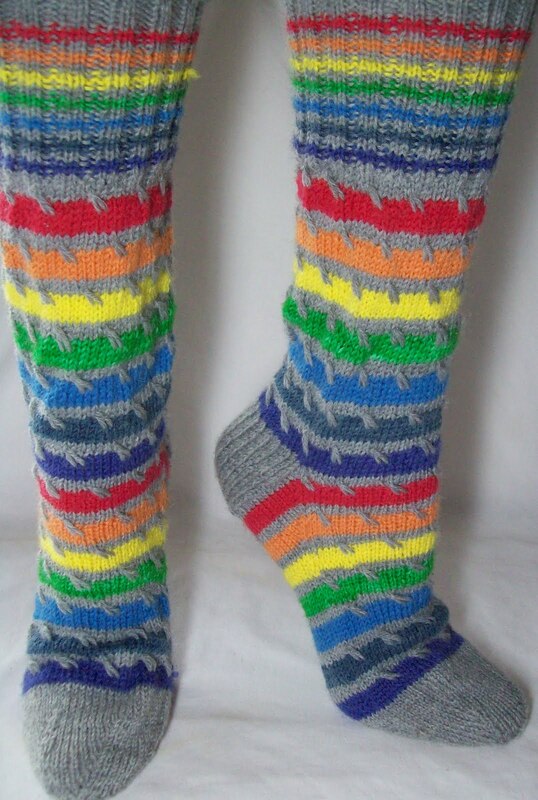 I went hunting a few weeks ago for the colors for the ROY G BIV socks, and for a nuetral tone to go along. I had a few choices—Black-thought knitting wih black is such a drag—still better the summer time with lots of natural light than winter and artifical light. 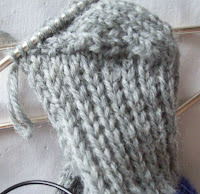 I had Flax –a lovely taupe shade from Patons, too and Greys—several shade of grey, including a marled grey. Most Patons, (as are the spectrom of colors) but also some Lane Cervanties Calzetteria in grey. (and an olive green I had total fogotten about. I have LOTS and LOTS of white—very little of it stays white—but since I already had grey and taupe, I didn't even think about dying some of the white to another nuetral color. 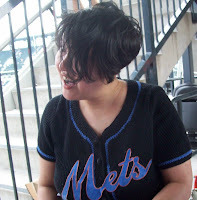 But—I miss filed (yeah lets say that, and not that I lost the zip lock back with 8 skeins of yarn) the greys. So yesterday I organized and consoladated all my sock yarns into to collections—1 suitcase sized bag of stripes, jacquards, hand painted and color ways that don't pattern. Another collection (equal in size) of solids and semi solids (most of these are home dyed) and a third (very small bag) of left overs. I really have a lot of sock yarn! 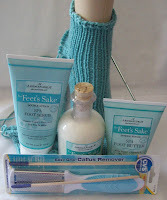 Not included in this, is the large skein of merino/cashmere yarn which while it was sold as sock yarn, is way to nice (and way to soft!) 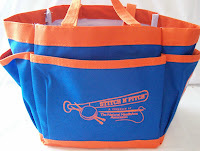 Plus it doen't have any nylon in it for re-enforcement. Cashmere is partculary sensative to wear from abraison making socks a bit to fragile for me. 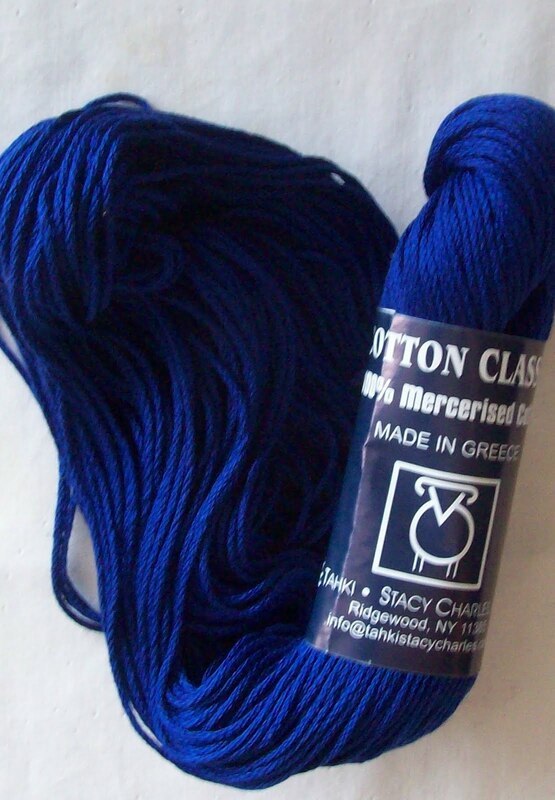 This yarn and the 3 skeins of Fashion Toes in dark blue jewel tones are going to be made into some small shawls. Melaine has been making them and I love what she'd done—so I am going to follow her example. While hunting (and organizing) I found 2 more of the mini bags I love for sock bags—so I now have 6 more pairs of socks lined up ready to go when the ROY G BIV socks are done. Speaking of the ROYG BIV—at last (the last place I looked of course) I found the grey yarns, and selected one (Kroy slate grey). 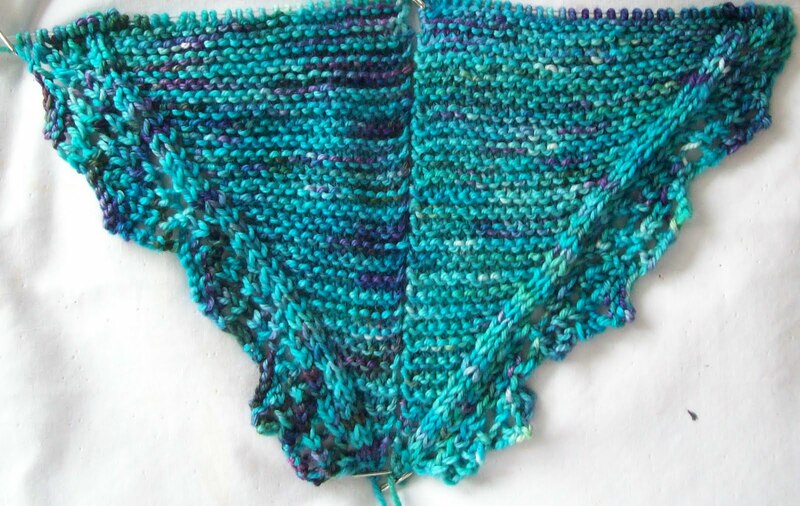 I cast on, using the Open Closed Long tail cast on (Nancy Bush learned this as the Estonian Cast on)--a pretty, and plenty stretch variation of the Long Tail. 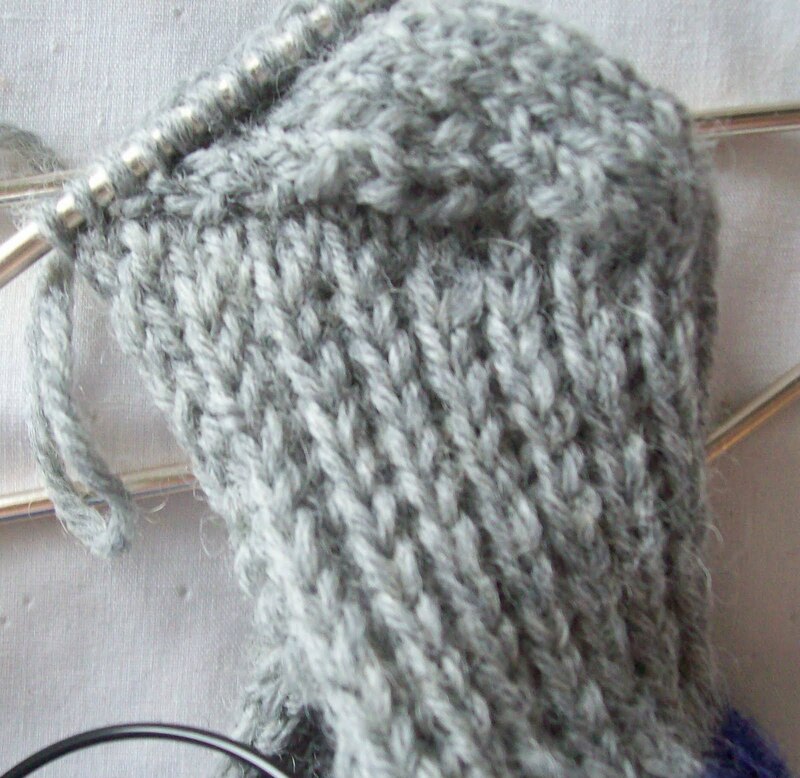 And followed up with 2 by 2 ribbing—1 by 1 is my favorite--but its nice to change up every once in a while. I did the math—and 1 full set of colors in the pattern I am going to be using is 56 R'sconsiderable shorter than my usual 80 or so R's—so I am making an extra deep cuff. It's already 1.5 inches –and I just have 2 colors! I cast on more stitches than usual, too for the extra deep cuff. 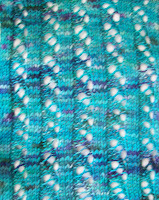 As always, I am weaving in the ends as I go—so when they are done, they will also be very nearly finished, as well. I haven't woven in the cast on tails--I use these as my BOR markers. But the red and orange tails are done.